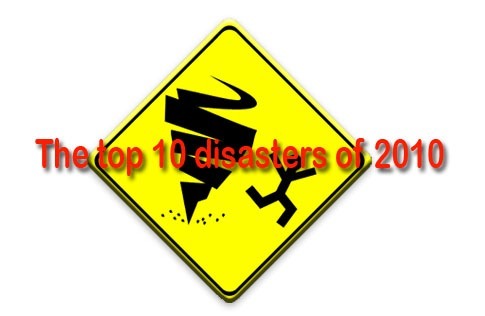 Top 10 disasters of the year in India! 2010 has had its own share of disasters. Despite the fact that we have advanced so much in preventing and predicting disasters, it is something we haven’t been able to stop happening. From political to technical to even natural disasters, there was a lot which brought a lot of misery to people. The only saving grace was the fantastic performance of our athletes who gave all of us a great reason to smile and be proud of our Indian-ness. The heat wave during the summers this year across the country killed more than 250 people and bringing misery to thousands others. It went on record to become the hottest summer in more than 50 years. Global warming anyone? The Apple iPhone’s antenna was a problem across the world and India was no different. With problems in signals and dropped calls, more and more people started voicing their opinion against Apple. From Giri to Laila to Jal the only thing interesting about these cyclones was their names. Otherwise it was all eerily similar – great loss of lives and property. One step closer to 2012, is it? From CWG to 2G to UP Basmati Rice, it was the year of scams in the country with each and everyone wanting a share of the pie. It seemed as though no day would pass of without us hearing of at least some scam or the other. What a shame! Last but not the least. The famous CAT test for MBA aspirants which went online last year but had results coming up this year turned out to be such a technical disaster with everyone wondering as to who was running Prometric. From bugs attacking the server to computers losing data, it ended up being such a SHAM! What is the Blogging scenario in India ? Corporate Blogging: Should it be formal ? Start Blogging and earn Rs. 10,000 every week. Are Bloggers powerful sneezers ? Online Videos + Blogging : The winds of change? Is Amitabh the highest paid blogger in the world? Can blogging land you a job? It’s Time to transform your marketing! 5 Golden Rules for Your Business Email ! Top 7 Myths of Personal financial Investment! Top 5 hot careers of 2011-12 !